We’d love your help. Let us know what’s wrong with this preview of Globalization and its Discontents by Joseph E. Stiglitz. To ask other readers questions about Globalization and its Discontents, please sign up. I just stumbled across this Open Letter to Joseph Stiglitz by Kenneth Rogoff writing as Economic Counsellor and Director of Research, International Monetary Fund. Rogoff is also the author and researcher of the excellent This Time is Different: Eight Centuries of Financial Folly , to which I gave five stars. However one swings on this debate, Rogoff's lively rejoinder to this book is, I think, essential reading. If nothing else, it's a good reminder to me to check my own confirmation bias. I'm not going to pretend I know enough to referee a debate between these two great minds. I do think, however, that if you've just read this book or are intending to read it, do see what the other side has to say in its defence. It's the least natural justice would require. It's not a great book, but Stiglitz provides a very useful history of the last 30 years from the perspective of how the IMF dealt with (or rather failed to deal with) financial crises as they erupted around the world. Its strength is the comparative, case study approach: Russia did it this way, China did it this other way; Brazil did it this way, Poland did it this other way. Let's look at which methods worked better. Sort of like an MBA in macro-economics in other words, where instead of looking at case studies of corporations you lo0k at case studies of countries. The main downer was the somewhat bash IMF tone, and Stiglitz gets somewhat repetitive towards the last couple of chapters. • The IMF is not some conspiring beast in bed with grasping financiers to make them richer. It's simply blinkered by a certain ideology where its economic beliefs have hardened into doctrine. And don't think businesses are any better. Many many enterprises have floundered on foreign shores, unable to adapt to the different ways of thinking there. No, Toto, you're not in Kansas anymore. • Sequencing and pacing matter. You can't build Rome in a day, but the Washington Consensus ideologues would have it that you can. Presumably, they also think that the best way to build a skyscraper is to simultaneously throw steel bars, concrete, glass, and metal plates into the air and it'll all come down into a pretty 80-storey building. • It's the reality, stupid! Look at the evidence and the data. When prescribing a certain development route, compare apples with apples. Countries are not alike, and financial crises are not alike. What worked in one situation may not work in another. So, we all know a wood fire is best put out with water, but try that on an oil or electrical fire and you're going to have trouble. The IMF, however, would beg to disagree. • You need a holistic view of the problem based on a hands-on understanding of the situation on the ground, and not based on an ivory-towered mathematical formula. The best example I have of this from the book is classical economists thinking that foreign lenders rush in where indigenous angel investors fear to tread: they think that raising interest rates in a severe recession is good because while it might destroy internal business confidence and turn solvent companies insolvent, foreign investors attracted by the higher returns will come in droves to lend to the impoverished, bankrupt businesses. Err… really? Only on Planet IMF I would say. • Unlike Dame Thatcher's famous remark that society does not exist, society not only exists, it matters. The social fabric is not what just keeps societies together, it's what keeps societies running and producing. Social chaos is not just bad for society, it's bad for the economy as businesses stay away from unstable countries and don't invest in them. And social trust once destroyed does not come back overnight. Imagine doing business with your ex who cheated on you. That's kind of what the IMF thinks can be done. NOT!!! • A market is a culture. Attitudes to employment, to entrepreneurship, to investing and using capital, these are not just things you can learn from a book. You can't take 10 million Russians, plonk them in an abandoned New York, and expect New York to remain New York with just a teeny difference in language. The workings of banks, the NYSE, the insurance companies, the businesses, all of these are culturally embedded in social mores and beliefs, culture in other words. That kind of soft skills and hard wiring take generations to take root. NYRB: Stiglitz has presented, as effectively as it is possible to imagine anyone making it, his side of the argument, including the substantive case for the kind of economic development policies he favors as well as his more specific indictment of what the IMF has done and why. His book stands as a challenge. It is now important that someone else—-if possible, someone who thinks and writes as clearly as Stiglitz does, and who understands the underlying economic theory as well as he does, and who has a firsthand command of the facts of recent experience comparable to his—-take up this challenge by writing the best possible book laying out the other sides of the argument. What is needed is not just an attempt to answer Stiglitz's specific criticisms of the IMF but a book setting out the substantive case both for the specific policies and also for the general policy approach that the IMF has advocated. I picked up Joseph Stiglitz book in the same purchase I got Naomi Klien’s No Logo and Peter Singer's One World. Obviously there is an interest in globalization in that recipe. I’ve been reading The Economist ([http://www.economist.com]) for some years and been mildly informed on globalization and the backlash against it evident in the protests against the IMF, World Bank, G7/G8, WTO and other multinational bodies associated with it. I didn’t really develop an interest in globalization until I re I picked up Joseph Stiglitz book in the same purchase I got Naomi Klien’s No Logo and Peter Singer's One World. Obviously there is an interest in globalization in that recipe. I’ve been reading The Economist ([http://www.economist.com]) for some years and been mildly informed on globalization and the backlash against it evident in the protests against the IMF, World Bank, G7/G8, WTO and other multinational bodies associated with it. I didn’t really develop an interest in globalization until I read The Best Democracy Money can Buy by Greg Palast. Palast’s book wet my appetite but Stiglitz, who was President Clinton’s economic adviser before joining the World Bank, really lays on the blame. He places most of the blame for the Asian Financial Crisis, the Russian collapse, and Argentina’s Defaulting, on the IMF. More specifically he claims that a shift away from the Keynesian ideas that the IMF and World Bank were founded on is to blame. What caused the shift? The introduction of Thatcherism and Ragantonian ideals, the ousting of experienced economist and the promotion of free market fundamentalist at the IMF. To support his accusations Stiglitz roams around the globe from one crisis to another pointing out the faults in the blind, ideological, one-size-fits-all prescriptions the IMF doled out to country after country in the past 25 years. Time and again the IMF’s blind belief in the Market becomes a vehicle for greed and capitalist hegemony. To back up the point that the IMF refused to learn from it’s mistakes and the experience of others Stiglitz points out several countries that refused to follow the IMF plan, and shows that while their development has not been as smooth as could be desired and they have not developed as fast as the IMF says they could, they have avoided the painful problems of many of the IMFs poster child countries: Thailand, Argentina, Russia. And stand better today than many of the countries who followed the IMF plans. I found the section of the Asian Financial Crisis the most poignant because shortly after I finished the book I traveled to Bangkok, the epicenter of the crisis. The problems that began in Bangkok when Thailand opened it’s market to ‘hot money‘ ([http://en.wikipedia.org/wiki/Hot_money]) are always recalled as something that happened ‘over night.’ How true those statements are really became apparent when I was in Bangkok. The skyline is filled with half completed skyscrapers and rusting cranes that have sat empty since 1997. Many construction sights literal closed the doors one night and never opened them again, putting hundreds of workers on the street over night. After nearly a decade Bangkok is just beginning to recover from it’s nightmare. If Stiglitz is to be believed the IMF leadership, which shares a large part of the blame because it pushed questionable policies faster than was advisable and without tailoring them for local conditions, has not learned its lesson. Stiglitz acknowledges that the goals of the IMF, the goals of Globalization, are not inherently bad, and need not lead to the problems that we have seen. Rather it is the way the IMF uses it’s political power and money to force these ideas on countries that are not ready for them that has lead to so much suffering and poverty. so... last year i decided i was gonna get my feet wet in the world of economics - and specifically development economics. i read some stuff by theory types i was interested in anyway (mike davis, david harvey), i read the shock doctrine, i read the end of poverty and i looked to paul krugman (and others) as the american financial system took a nosedive into the shitter. globalization and its discontents is the best of the bunch so far. it's *really* informative - not to mention level-headed, clea so... last year i decided i was gonna get my feet wet in the world of economics - and specifically development economics. i read some stuff by theory types i was interested in anyway (mike davis, david harvey), i read the shock doctrine, i read the end of poverty and i looked to paul krugman (and others) as the american financial system took a nosedive into the shitter. globalization and its discontents is the best of the bunch so far. it's *really* informative - not to mention level-headed, clearly-written (though dry in a way that's unavoidable when you're talking about interest rates) and super pragmatic. stiglitz is a nobel-prize winning economist who once worked for the world bank, and he pissed a lot of people off when he published this book. which makes it sound radical, but that's not quite right. stiglitz is in favor of a regulated market, with strengthened social services, checks, balances, etc. as such, he avoids sensationalizing or romanticizing the issues he addresses. on the whole, he treats globalization as something neutral, choosing instead to examine the ways its name has become synonymous with the free market fundamentalism of the "washington consensus," and what to do to alter its course, accordingly. his critique of these very powerful clubs is rigorous and multi-faceted. i'm not a naomi klein hater by any means (i thought her shock doctrine raised some much-needed questions), but this book kinda blows it out of the water in the research department (even if it's not as much of a page-turner). my only complaints are minor ones. stiglitz touches on some big issues towards the end, mostly in regards to medical discoveries (bio-piracy, etc.) and the environment. on account of these two problems in particular, i feel somewhat unconvinced by his VERY, VERY guarded optimism about a market system, and i wish he'd explored some of the complications he notes briefly toward his conclusion more thoroughly. A cogent critique of IMF's unhealthy obsession with pushing down inflation at any expense to debtor countries and the hypocrisy of developed countries in preaching free market fundamentalism to the developing world while keeping their own doors closed. The author emphasizes on initiating and ensuring democratic discoursing in international institutions, calling for an end to behind-the-doors decision-making that has been the norm so far. The case is driven home by delineation of the economic cri A cogent critique of IMF's unhealthy obsession with pushing down inflation at any expense to debtor countries and the hypocrisy of developed countries in preaching free market fundamentalism to the developing world while keeping their own doors closed. The author emphasizes on initiating and ensuring democratic discoursing in international institutions, calling for an end to behind-the-doors decision-making that has been the norm so far. The case is driven home by delineation of the economic crises that followed from IMF policies in East Asia, Russia and Latin America. It is very dull. Almost feels as a history book. Some insightful information regarding the IMF, but it is catered to people who know these topics. Generally a good description of the way in which IMF and US Treasury policies have played out in the developing world from the 1980s to 2002. Broadly speaking, these institutions have done their best to serve US and Western financial interests, rather than seeking a benevolent and mutually beneficial globalization, despite the IMF's mandate to promote international economic stability and growth. Of course, one of the big problems with these policies is that they don't actually serve the interest Generally a good description of the way in which IMF and US Treasury policies have played out in the developing world from the 1980s to 2002. Broadly speaking, these institutions have done their best to serve US and Western financial interests, rather than seeking a benevolent and mutually beneficial globalization, despite the IMF's mandate to promote international economic stability and growth. Of course, one of the big problems with these policies is that they don't actually serve the interests of the US, they only serve the interests of a small collection of economic elites who arrange everything so they can accrue more personal wealth at the expense of not only citizens of the global south but also citizens of the US and the global north. David Harvey points out that Stiglitz assumes that the inequalities and the poor management of economic globalization under the auspices of neoliberal ideology are a byproduct of poor choices. Harvey suggests that the upward redistribution of wealth within and across nations may actually the the hidden purpose of this ideology. The goal, in other words, is not actually to eliminate poverty or create a more equitable system, but is in fact the re-establishment of class privilege. While I think people like Freedman probably didn't have this intention, I suspect the workings of international finance and exploitative late capitalism is probably more conspiratorial than Stiglitz allows. A point I find particularly interesting because he twice mentions and dismisses suspicions from East Asia and then Russia that the IMF, World Bank, and the west had conspired to ruin their regional/national economies in order to eliminate global competition. Stiglitz probably didn't make many friends inside the International Monetary Fund (IMF) when this book was published in 2002: ''Globalization and its discontents'' at times seems like a long criticism of the IMF. No, let me rephrase that: This book is actually a character assassination of the IMF and the policies it implemented during the 1980s and 90s. 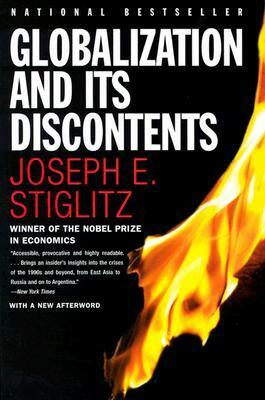 This book focuses on 2 episodes in the 1990's: the East Asia crisis of 1997-1998 and the transition from communism to market economy in Russia af Stiglitz probably didn't make many friends inside the International Monetary Fund (IMF) when this book was published in 2002: ''Globalization and its discontents'' at times seems like a long criticism of the IMF. No, let me rephrase that: This book is actually a character assassination of the IMF and the policies it implemented during the 1980s and 90s. This book focuses on 2 episodes in the 1990's: the East Asia crisis of 1997-1998 and the transition from communism to market economy in Russia after the collapse of the Soviet Union in 1991. In both cases, Stiglitz argues that the IMF, and other financial and economic institutions like the World Bank and the U.S. Treasury department, used incorrect policies that resulted in suboptimal results. During these events, Stiglitz worked as an economic adviser to president Clinton and as a senior vice-president of the World Bank, which, in a way, makes him an eye witness to how the IMF policies were designed and implemented. Besides the criticism on how the IMF handled these 2 events (to which I will turn in a minute), Stiglitz is not impressed with how the IMF in general operates. He sees the IMF as an organization stuck in a dogmatic free-market ideology, which disdains the role of the government in the economy. Also, he feels the IMF is too much, if not exclusively, focused on inflation, and gives little attention to other important economic indicators such as growth and employment. Equally problematic is that the IMF has little, or, according to Stiglitz, no room for discussion and debate. The free-market solutions the IMF imposes on countries who seek its help tend to be ''on size fits all'', and often don't take into account the particular circumstances of the particular country. Besides little debate inside the IMF, he also notices little curiosity towards new solutions and ideas. Stiglitz favours a more mixed economy, where the market and the government have both important roles to play: The market to make sure resources are allocated in the best possible way, the government to make sure that the markets work and to prevent undesired side-effects of a completely unregulated free market. In the East Asia crisis of 1997-1998, the IMF prescribed the ''Washington Consensus'', a mix of policies that include a balanced budget, low inflation (achieved through increasing interest rates), liberalization of both commercial and financial markets and privatization. The Washington consensus prescriptions were originally designed to fight various crises in Latin America in the 1980s. In Latin America, many countries had governments that excelled in prolific spending, resulting in massive debts and budget deficits and horrific inflation. In theory, the prescriptions made sense, in practise they turned the 1980s into a lost decade for almost all countries where the Washington consensus was applied. Part of the problem of implementation was sequencing, doing some things in the wrong order, and doing others too fast. In East Asia in 1997, the nature of the crises was different from those in Latin America a decade earlier. East Asian countries such as Thailand, Korea and Malaysia had high saving rates (which had allowed them to self-finance their incredible growth until 1997), budget surpluses and low inflation. Applying the one-size-fits-all prescriptions of the Washington consensus, mostly designed to fight inflation in Latin America, to East Asian economies as a condition for financial help from the IMF seems to have been the wrong decision. What made this obligation for the East Asia countries to accept the Washington consensus if they wished to receive the IMF money bail-outs extra ironic was the fact that, according to Stiglitz, the IMF was (partly) responsible for the crises. The IMF had insisted that many East Asian countries open up their financial markets. Many of those countries were reluctant to liberalize their capital markets, but ended up doing so anyway. Hot investor money flowed in, fomenting local bubbles (such as a real estate bubble in Thailand), and at the first sight of trouble, the hot money flowed out again, leaving destruction and crisis in its wake. Stiglitz argues that instead of forcing the Washington consensus on the East Asian countries, the IMF should have chosen a more Keynesian approach and helped those countries in expanding government spending to offset the fall in demand in the market. Again, ironically, this is what the IMF was originally created for, but somehow, during the late 1970s and early 1980s, free-market fundamentalists had taken hold of the IMF, and they saw stimulus and deficit spending as undesired government interferences in the free market. Summarizing: The IMF had not only provoked the East Asia crisis, but then also proceeded to prescribe the incorrect policies to solve, or at least alleviate, the crisis. The result was a IMF-facilitated crisis that was longer and worse than necessary. With the transition from communism to a market economy, the IMF c.s. again made several mistakes, which again can be explained by its dogmatic free-market fundamentalism. Here Stiglitz objections to IMF policy have mostly to do with the order and timing of the policies. Basically, he thinks steps towards market economy were taken too fast. To underline his point, Stiglitz compares the communism-to-market-economy process of China and Russia, and concludes that China's slow approach has shown better results: China was poorer that Russia at the start of the decade and much richer at the end of it. In Russia in the early 1990s, IMF recommended a quick move toward a market economy, and especially stressed the importance of rapid privatization. Stiglitz thinks that this rapid privatization was a bad idea, and that basic economic and financial infrastructure and institutions should have been put in place first (E.g. First create anti-trust laws, establish the rule of law and especially the respect for private property and then start with privatization). The result of the rapid privatization, as favoured by the IMF, was that government monopolies became private monopolies, which were more inclined to abuse their monopoly position. Making matters worse, the Russian government usually received very little, almost giving massive state assets away for free to friends. On top of that, since property rights were not yet well established, and because many of the new owners realized that future governments might reverse these privatizations, the new owners proceeded take as much money as they could squeeze out of the newly privatized companies abroad. Crony capitalism galore. Benefits for the average Russian citizen: Almost none. Then, in 1998, when the global impact of the East Asia crisis reached Russia, the IMF made again mistakes in Russia, when it decided to prop up the Russian rouble. In order to do so, the IMF lent billions of dollars to Russia, which only delayed the reckoning, allowing rich Russians to place their money in save havens, and burdened the country with unnecessary additional debt. Why was the transition successful in China and not in Russia? Stiglitz points to 2 factors: Slow vs fast implementation and local design vs foreign (IMF) recommendations. In the last parts of the book, Stiglitz makes some grave accusations when he implies that the IMF champions the special interest of the financial community. He may be on to something, but at the same time, here he is on the slippery slope towards the realm of conspiracy theories (something he said in the beginning book he would not do). It was especially interesting to read this book in 2015, in the aftermath of the 2008 financial crisis. The great debate of austerity versus stimulus for growth is still being held in Europe today. Especially relevant today is what Stiglitz has to say about moral hazard. Lenders in first-world countries can safely lend to countries and companies in the developing world because they know that in times of crises, the IMF will bail them out. This happened in the East Asia crisis: Western banks lent to Asian companies. Those companies entered hard times when the crises broke out. IMF lent money to the governments, so that they could pay back the western lenders. Many of those companies went bankrupt anyway, leaving the countries with massive debts and the western lenders almost completely compensated. This is not very different from what happened in Greece in the last couple of years: Banks that had lent money to Greece were almost completely paid back by the bailouts Greece received. Relatively little money of those bailouts actually reached ordinary Greeks. See also ''Greek debt and a default of statesmanship'', Martin Wolf, Financial Times, 27/01/2015. Low wages, less rights, and less spending power create a world that is hostile to globalization. Exploitation and market power comping from huge multinational companies is a reality that needs to be addressed. Governments, people, and entrepreneurs should work together to change the current landscape. I've read this one for my classes on global political problems, but I really liked it! Makes me think twice about what we hear from news and politicians. The good professor has done a remarkable job here. I enjoyed going through the engaging chapters. However, it’s all about the IMF, IMF, IMF! It might as well be titled “How the IMF Screwed Up and What to Do About It” I don’t think these financial institutions alone could represent the concepts, complexity and dynamics involved in globalization. I hope he gets to publish a revised edition. Overall, well done. I'm a dope when it comes to economics, but my impression is that this book has been hugely influential among the anti-corporate globalization crowd. It came out shortly after the Seattle WTO protests and soon popped up on the bookshelves many of my development-minded friends. It's easy to see why: Stiglitz is about as prestigious a development economist as you are likely to find--Nobel Prize winner, former chief economist at the World Bank, by some metrics the most cited economist working today. I'm a dope when it comes to economics, but my impression is that this book has been hugely influential among the anti-corporate globalization crowd. It came out shortly after the Seattle WTO protests and soon popped up on the bookshelves many of my development-minded friends. It's easy to see why: Stiglitz is about as prestigious a development economist as you are likely to find--Nobel Prize winner, former chief economist at the World Bank, by some metrics the most cited economist working today. So if he says something has gone wrong with globalization, people listen. His message here is very reform-minded--he thinks globalization is here to stay--but his arguments should resonate with anyone concerned about poverty in the developing world, or about jobs here in the U.S. His basic thesis is that the IMF has drifted from its Keynesian roots and been hijacked by a narrow economic orthodoxy that rabidly pursues privatization, market liberalization and low inflation to the detriment of all other social and economic goals. The attack of the market fundamentalists! He notes that this prescription for economic growth, dubbed the 'Washington Consensus', is far from the consensus position among economists. Indeed, it seems as if the IMF's policies are designed for the benefit of the financial elite, rather than with the goal of achieving broadly-shared prosperity in the targeted countries. Hence the IMF's focus on inflation rather than unemployment, and their relentless drive to open up markets to foreign investors rather than fostering local entrepreneurship. Stiglitz writes in a no-nonsense, straightforward fashion. His prose is almost surprisingly facile, for an academic of his stature. It totally works. It's a great and easy read. 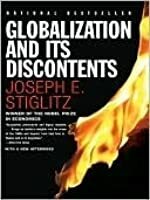 1) Globalization is not working for the developing world, because the international economic institutions that were created to ensure global stability in the early 20th century (the World Bank & IMF) have been overtaken by ideological slaves to the ideal of the free market, Stiglitz writes in a no-nonsense, straightforward fashion. His prose is almost surprisingly facile, for an academic of his stature. It totally works. It's a great and easy read. 1) Globalization is not working for the developing world, because the international economic institutions that were created to ensure global stability in the early 20th century (the World Bank & IMF) have been overtaken by ideological slaves to the ideal of the free market, and the international business and financial communities who are looking to make a quick, cheap buck rather than build growth in poor nations. 2) The purge of less slavish academics from the World Bank and IMF during the Reagan years has led to a revolving door of corporate & financial sector executives who shuffle between posh jobs at the World Bank, IMF, US Treasury, and international hedge funds & private banks. They are not pushing policies that further the mission of global financial stability - they are looking after their rich friends & themselves. 3) The IMF & World Bank push a one-size fits all agenda on needy nations, in which they are forced to open their markets to international trade liberalization regardless of local conditions including social & political stability, and, more importantly, regardless of whether appropriate legal and regulatory institutions have been put in place to mitigate the 'vagaries of the open market.' This leads to total looting, as in Russia, when trade liberalization proceeded before the rule of law. This also leads to a domino effect of financial ruin, as in East Asia, when the one-size fits all approach did not match the cultural and political needs of the region, but led to widespread destabilization. 4) The way forward has to be a tailoring of market liberalization to the particularities of individual nations and regions. One size does not fit all, and the IMF & World Bank are wrong to insist on it. Reform of these international institutions will require greater transparency and accountability, and a true changing of the guards - the captains of the ship must be changed, because they are too ideological and too invested in private interests to change their course voluntarily. So, this is one of those books that I've been meaning to read for so long, and heard so many arguments around the same topic, that I almost thought I had read it. But I finally made the time to read it, and I'm really glad I did. I can see why this book was popular, because it's an insider from the IMF saying some of the things that many people from outside had been saying was the problem. That they made the problems of the countries they were trying to help, much worse. And all the countries do So, this is one of those books that I've been meaning to read for so long, and heard so many arguments around the same topic, that I almost thought I had read it. But I finally made the time to read it, and I'm really glad I did. I can see why this book was popular, because it's an insider from the IMF saying some of the things that many people from outside had been saying was the problem. That they made the problems of the countries they were trying to help, much worse. And all the countries doing well are the ones that ignored their advice. He doesn't talk much about trade rules, and he also talks very little about all the other problems of finance. So, he totally misses the coming financial crisis. But the biggest omission for me, is he looks at how the global south is hit hard by these policies, he doesn't look at the flip side, that this is actually of benefit to the US (he makes the point that it's good for financial interests, but not how this benefits the US more broadly). "Over the past decade, we have altered not only our institutions—encouraging ever more bigness in finance—but the very rules of capitalism. We have announced that for favored institutions there is to be little or no market discipline. We have created an ersatz capitalism, socializing losses as we privatize gains, a system with unclear rules, but with a predictable outcome: future crises, undue risk-taking at the public expense, and greater inefficiency." Maldita globalização que é resultado de um processo de enxugamento do território e das comunidades, logo do trabalho e das pessoas. O resultado? um nevoeiro de capital que circula pelo mundo, corroendo valor e saltando para o próximo local, sempre deixando menos do que o que ofereceu. Em particular, a sustentabilidade nas suas três dimensões, sai afetada e torna mais desigual os processos económico, ambiental e social - criando muitas vezes desiquilíbrios que resultam do enfraquecimento dos Estado Maldita globalização que é resultado de um processo de enxugamento do território e das comunidades, logo do trabalho e das pessoas. Em particular, a sustentabilidade nas suas três dimensões, sai afetada e torna mais desigual os processos económico, ambiental e social - criando muitas vezes desiquilíbrios que resultam do enfraquecimento dos Estados. Um dos primeiros grandes críticos da globalização e da inevitabilidade. first hand account of some a short comings of globalization, specifically related to Stiglitz time the World Bank and IMF. Essentially he accuses these organizations of coercing developing nations to abide by strict "market fundamentalism" which involves economic theories that look good in paper and in economic textbooks, but fail to take into account unique characteristics of countries, their governments, culture and demographics. Stiglitz does seem arrogant at times, he too easily points out s first hand account of some a short comings of globalization, specifically related to Stiglitz time the World Bank and IMF. Essentially he accuses these organizations of coercing developing nations to abide by strict "market fundamentalism" which involves economic theories that look good in paper and in economic textbooks, but fail to take into account unique characteristics of countries, their governments, culture and demographics. Stiglitz does seem arrogant at times, he too easily points out shortcomings and failures of market integration in Southeast Asia and Latin America without posing much of a solution. I suppose that this book contains essential criticism of globalization after the 1980s. Nonetheless, it has a wrong name for the contents of the book. The book actually criticized the neoliberalism, unrestricted privatization and the IMF since they led to disorganization and inequality in the developing countries. The book was written before the crash of 2008 and the financial crisis proved that he was right to the discontents of the global financial system. You should take this book examine the I suppose that this book contains essential criticism of globalization after the 1980s. Nonetheless, it has a wrong name for the contents of the book. The book actually criticized the neoliberalism, unrestricted privatization and the IMF since they led to disorganization and inequality in the developing countries. The book was written before the crash of 2008 and the financial crisis proved that he was right to the discontents of the global financial system. Fine, Stiglitz writes well on a subject that is hot with the developing world, and he is a writer after my own heart, especially as he argues on how the free market and the wonderful hypocrisy of IMF and WTO (And by that stroke, the developed economies) cripple the southern hemisphere. But honestly, how many books can he write with the same contents, contexts and examples? The argument is good, I am periodically bored with his historical narrative, and all in all, if you have to read a Stiglitz Fine, Stiglitz writes well on a subject that is hot with the developing world, and he is a writer after my own heart, especially as he argues on how the free market and the wonderful hypocrisy of IMF and WTO (And by that stroke, the developed economies) cripple the southern hemisphere. But honestly, how many books can he write with the same contents, contexts and examples? The argument is good, I am periodically bored with his historical narrative, and all in all, if you have to read a Stiglitz book, pick up this one. По случай успешната ми защита на дипломна работа днес най-сетне се наканвам да пиша и за другата книга на Джоузеф Стиглиц, след като миналата седмица ревюирах “Свободно падане”. Joseph Eugene Stiglitz, ForMemRS, FBA, is an American economist and a professor at Columbia University. He is a recipient of the Nobel Memorial Prize in Economic Sciences (2001) and the John Bates Clark Medal (1979). He is also the former Senior Vice President and Chief Economist of the World Bank. He is known for his critical view of the management of globalization, free-market economists (whom h Joseph Eugene Stiglitz, ForMemRS, FBA, is an American economist and a professor at Columbia University. He is a recipient of the Nobel Memorial Prize in Economic Sciences (2001) and the John Bates Clark Medal (1979). He is also the former Senior Vice President and Chief Economist of the World Bank. He is known for his critical view of the management of globalization, free-market economists (whom he calls "free market fundamentalists") and some international institutions like the International Monetary Fund and the World Bank.